The Combat Uniform OD (Olive Drab) is ideal for almost any situation where you need to blend in with the background. 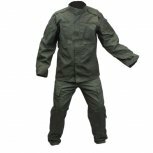 Our Combat Uniforms are made out of a durable and long lasting Nylon/Cotton Rip Stop blend. Using durable material, combined with Rip Stop sewing, our Combat Uniforms are built to be abused. Drag it through the mud, run through the woods, even jump in some thorn bushes, your Combat Uniform Jacket and Pants will hold up. Loaded up with pockets, the Combat Uniform can easily hold anything you need to bring on the field with you. From batteries to tools, it will easily fit into the Combat Uniforms pockets. With Velcro on the shoulders and on the front of the jacket, you can proudly display your team insignias. Each arm of the Combat Jacket features a large pocket with a Velcro strap that keeps the flap closed, ensuring you valuables or gear doesn't accidentally fall out. Two additional angled pockets are located on the front of the jacket. Created for ease of use, the angled pockets allow you to quickly grab what you need at a more natural angle. The pockets don't stop there, the Combat Uniform Jacket also has another pocket on the right arm, perfect for holding any extra accessories. The Combat Uniform Pants feature an adjustable drawstring waist for the perfect fit. Not only does it have an adjustable waist, but it also has adjustable ankle cuffs. With ten pockets, the Combat Uniform Pants can easily carry whatever you need when you are on the field. The Combat Uniform Pants have your standard front pockets, and two back pockets held closed by buttons, ensuring whatever you have doesn't fall out. At your thigh level are two massive cargo pockets, one on each leg. Easily able to hold even the largest accessories, they are securely fastened closed by both Velcro and a drawstring. Further down on each leg is a smaller cargo pouch perfect for tools or even your radio! Finally, each leg features a pocket with reverse storage, meaning the opening is at the bottom, and the storage is above it. These pockets are perfect for a swab or squeegee that you want to fall right into your hand when you open your pocket! Note: The Combat Uniform includes both the Jacket and Pants in the size you choose. Inseam: 28 1/2" to 31 1/2"
Inseam: 29 1/2" to 32 1/2"
Inseam: 30 1/2" to 33 1/2"
Inseam: 31 1/2" to 34 1/2"
Inseam: 32 1/2" to 35 1/2"